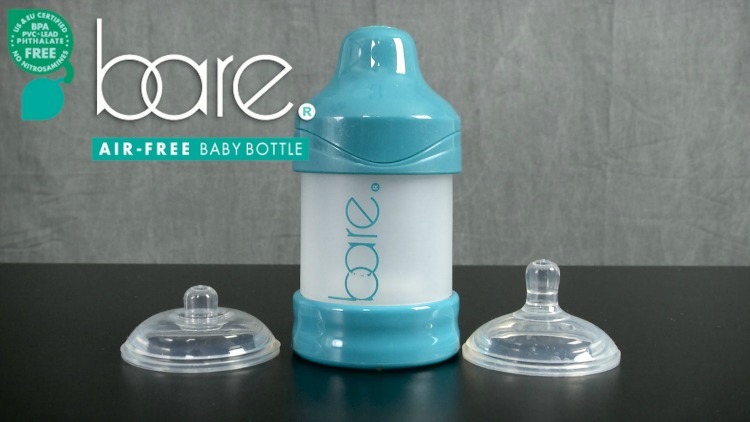 Meet Bare- the air-free baby bottle that is putting an end to gas, colic and spit-ups for precious little babies! Check out the video by CNBC that will take you through how this incredible bottle was made, and why it’s scientifically proven to reduce reflux in little ones. It’s kind of like a syringe, but for milk, and of course, safe. “It’s called air free because it doesn’t allow air inside. You can expel the air out of the bottle before feeding the baby, so the milk is 100% milk and not mixed with air,” Diaz told abc7. It’s been selling like crazy, and has products available specifically for breastfed babies too. They range from AUD $20 – $70. The product doesn’t ship internationally directly from the online retailer, so your best bet is to keep an eye on ebay, but a word of warning: you’ll be paying a bit extra. From what we can see, they’re currently retailing on ebay from around $41 to about $80…with an extra $50 postage. I guess it depends on how much you really want your babies milk to air-free!